What promised to be a relatively easy day has of course turned out long and tiring. We rose at about 07:30 and packed the car once more before checking out of the Crocodile Inn. Once checked out, we drove over to the Kakadu Bakery for more of their home made baked goodies. M. got a herb scroll like yesterday, plus a Vegemite scroll, while I got a cheese and tomato pizza pull-apart, plus an apple danish to eat right away. We also got a large bottle of water for the day's travel. Then we stopped at the petrol station to get some iced coffee milk for M. while I cleaned the car windscreen once again. And then we were off on the Arnhem Highway towards Darwin. 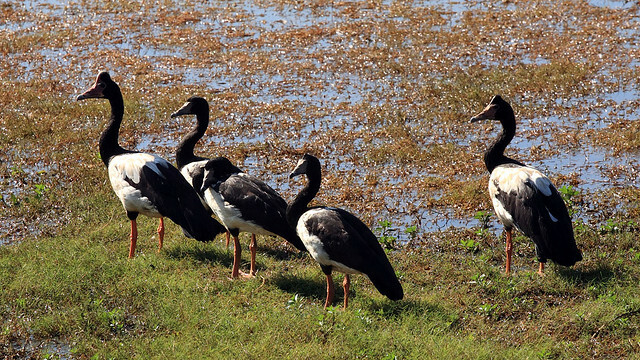 About 30 km down the road from Jabiru is Mamukala, a wetland area with a large bird observation hide. It was a short walk from the carpark and afforded a spectacular view of marshy land to the east, containing several magpie geese and dozens of whistling ducks most obviously, assembled only 10-20 metres from the hide. A bit more careful observation revealed egrets (of either the lesser or intermediate variety - I'm still not sure if we ever managed to see a greater one), straw-necked ibis, pied herons, green pygmy geese, and after a bit of straining through a telephoto lens, some jacanas. It wasn't quite as impressive as the Yellow Water cruise, but the fact that you could simply sit and observe for as long as you liked made it very cool. As we watched, the duck flock grew as individual ducks arrived from the sky in dribs and drabs. We watched and scanned for other birds for several minutes and then left to continued our drive. 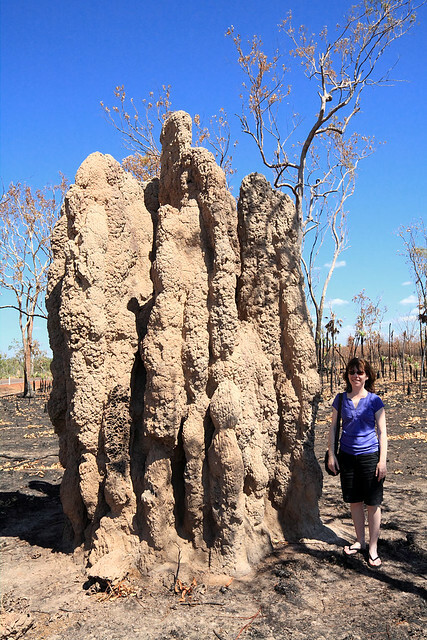 We stopped briefly at one point to have a good look at an enormous termite mound, just sitting by the side of the road. The photos are proof that the monster was well over twice M.'s height. Further along, after passing the Adelaide River crossing, we stopped off at the Window on the Wetlands Visitor Centre, a small but modern facility perched on a hill overlooking a small, shallow lake. The displays inside were decent but felt anticlimactic after the real life displays of the wonders of nature we'd seen the past few days. 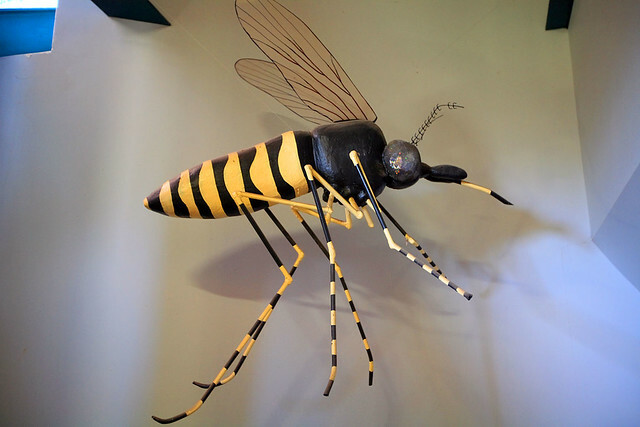 But the air conditioning was welcome and there was a cool giant mosquito sculpture. Near this visitor centre was the intersection point of two Aboriginal Dreaming tracks: the Dingo and Turtle Dreaming lines. Leaving in the car, we saw a jabiru flying across the road in front of us and land in the marsh to the left side of the car. From there we drove straight on into Darwin, stopping off 15 km out of the centre of the town at the Crocodylus Park. Before going in, we ate our lunch from the Kakadu Bakery. Then it was into this wildlife park and the closest thing Darwin has to a zoo. It had displays of several exotic animals, including lions, tigers, a leopard, several species of small monkeys, an ostrich, several Australian animals includin emus, wallabies, wallaroos, some snakes, and of course lots of crocodiles. Lots and lots of crocodiles. I mean lots. 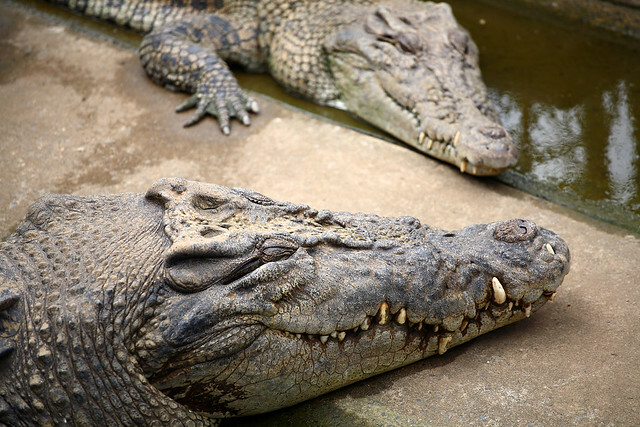 We started by walking the crocodile breeding pens, where pairs of large male and female crocs were kept together. There were also two large lagoons in which younger crocs milled by the hundreds, and some smaller pens for even younger crocs. All sorted by size so that nowhere had larger ones together with smaller ones that might lead to some cannibalistic behaviour. After looking around all the animals and the impressive museum exhibit - billed as the "world's most extensive crocodile museum" - we assembled with some other park visitors for the 14:00 guided tour, croc feeding, and croc handling. The guide began by feeding some of the mid-sized crocs in one of the lagoons by hauling chunks of chicken out on a washing-line-like device, dangling the meat over the water. 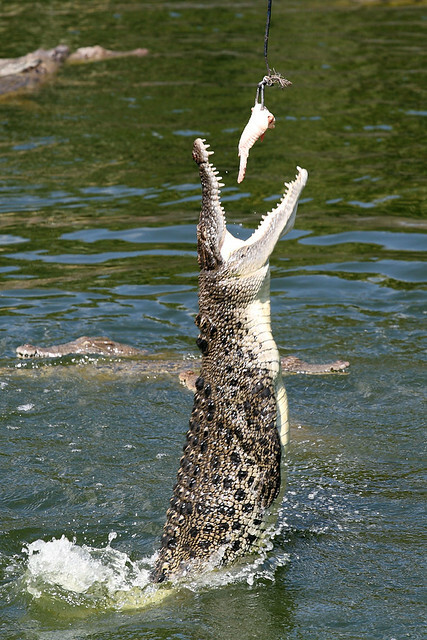 The crocs leapt a metre or so out of the water to grab the food. Then he moved on to feeding the fully grown pairs in the breeding pens. These ones were particularly impressive. The guy got some volunteers to dangle the chicken on a fishing-rod-like arrangement, wiggling the food over the crocs so that they leaped up to grab it. One animal moved at lightning speed, taking the chicken with a loud popping sound in a blinding flurry of spray from the pool. The guide said the sound was the croc's jaws snapping shut - most impressive. The guide kept up a non-stop chatter and commentary, taking us past pens holding juvenile crocs and also some American alligators, describing various scientific facts about the animals, plus details of their feeding, breeding, conservation, farming, and so on. By 15:00 he was done with the tour and went to get a couple of baby saltwater crocs for us to hold. The one he handed to me was about 80 cm long and had its mouth taped shut, because he said even at that size they could cause nasty wounds. The skin was scaly but quite soft - very similar to a snake. After sitting docilely for a few seconds, the croc began to struggle and I could feel just how powerful and muscly the creature was - it took some effort not to lose hold of it. When it calmed down, I handed it off to the next visitor and we departed to wash my hands (as instructed by the guide for hygiene reasons) and leave the park. It was definitely worth stopping here for the incredible close-up encounters with the crocs that we'd seen at a greater distance in the wild. We drove the last few kilometres into Darwin proper and found out hotel for the next three nights, right on the beach-front esplanade running along Darwin's west side. The carpark was a bit confusing as we found ourselves headed towards an exit with no option to turn back into it to keep looking for a spot. Thankfully there was a hotel employee at the exit, who told us to go through the boom gate and turn around outside to come back in, and also that the $6 fee didn't apply to hotel guests. So we parked, unloaded the car of the major items, and checked in. We had an hour or so to rest and then just before 17:00 we headed out in the car to Mindil Beach where there is a large market every Thursday (and Sunday) set up along the esplanade just behind the sand dunes running along the beach. 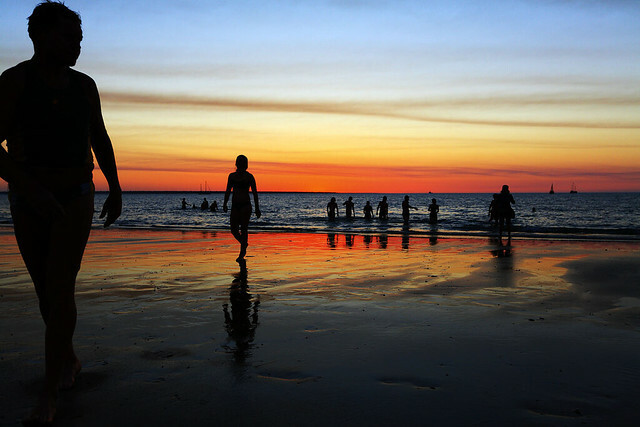 The beach faces west out on to Port Darwin, so the sun sinks as a fiery ball into the water (well, into the distant peninsula on the horizon, but close enough). The market is a strip of three adjacent rows of arts and craft stalls, produce, hot food, buskers, live entertainment, and so on. 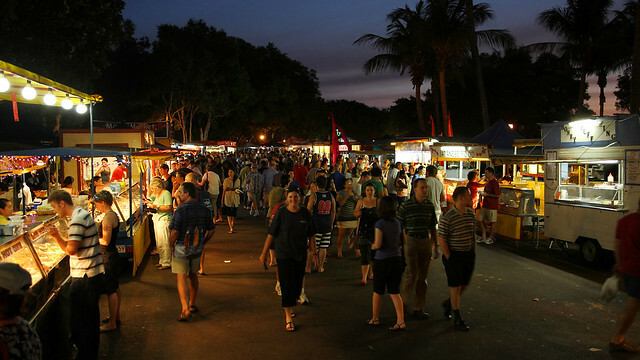 We parked at a convenient and large area adjacent to the market and wandered up and down the stalls, experiencing the sights, sounds, smells, and tastes of Darwin. I picked various pieces of finger food from amongst the food stalls throughout the evening - a Thai curry puff, which was large enough to be close to a meal itself, a skewer of satay prawns, and a yakitori skewer. M. got a "cow ball" from the Lucky Cow, a vegetarian place - it was made of potato, lentils, and spinach. We also had some delicious mixed fruit juices with crushed ice. My one included ginger for an exotic kick. Wandering between the stalls, M. spotted Merv Hughes amongst the crowding throngs. It sure looked like him, and with the Australian cricket team in Darwin for a series versus Bangladesh, it may well have been. Besides the food, there were dozens of stalls to browse. M. liked a kangaroo leather one, and went back later on to buy an inexpensive leather wrist band. She also got a wrap-around skirt in light cotton with a dark pattern that looked like a cross between paisley and traditional batik designs. The south-east Asian influence was obvious in the many stalls - both food and crafts. There was a guy selling bullwhips and giving whip cracking demonstrations before handing a demo string whip to young kids to try their technique - I saw a girl of about 4 years giving it a go. 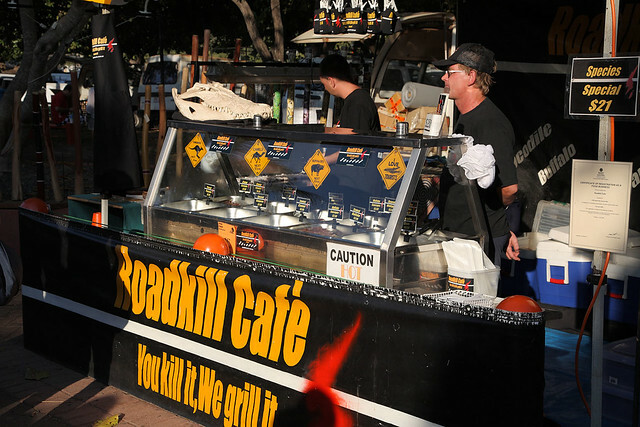 One of the food stalls was the "Roadkill Cafe", where they had hot skewers and sausages of crocodile, kangaroo, camel, buffalo, emu, and possum laid out under the motto "You kill it, we grill it". As we wandered the stalls, the sun dropped slowly into the bay and hundreds of people with take-away containers full of the heady aromas and tastes of the food stalls trekked over the dune to sit on the sand of Mindil Beach and watch it. 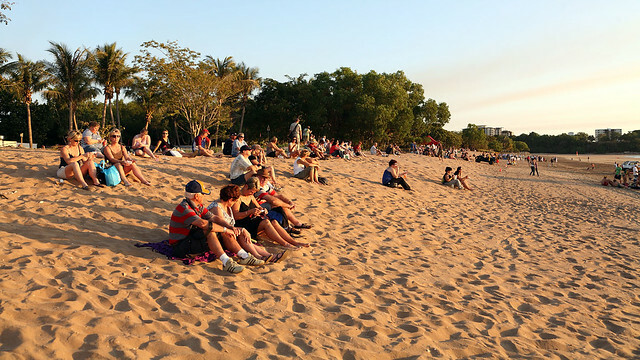 There must have been around a thousand people or more sitting on the sand by the time the sun went down, with more swimming or splashing in the water, and hundreds of others on collapsible seats on the grass behind the dune. A busker was working part of the crowd, doing juggling and keeping up a mile-a-minute patter that kept the crowd laughing. 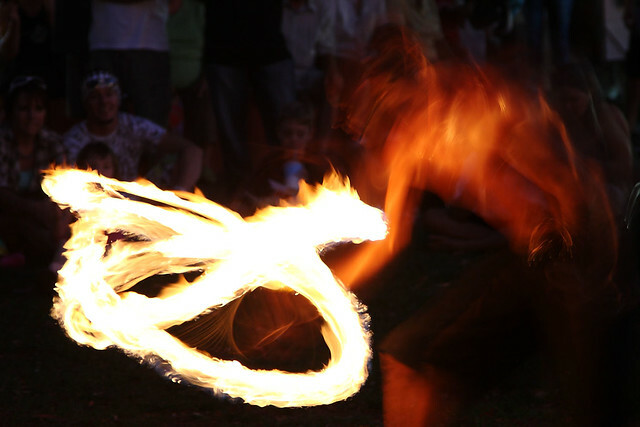 When the sun went down he lit up fire sticks and began juggling and other feats of dexterity with those. Not far from him was a woman playing pan pipes and scattered around were maybe half a dozen musicians performing. A man and a woman dressed as a Spanish or perhaps Argentinean tango pair were wandering around on stilts that made them about three metres tall, posing for photos with people, and engaging in humorously accented conversations. Back at the craft stalls, M. bought a couple of coconut shell necklaces for her mum and sister. And for further food, we each had a hot, fresh crepe with banana, mine also with maple syrup. And because it was such a warm evening, I finished off with some locally made ice cream - mango and strawberry scoops. We left the market about 20:30, having spent about three and a half hours experiencing its various delights. We drove back to our hotel and called it a day. Last updated: Wednesday, 23 January, 2019; 12:56:57 PST.